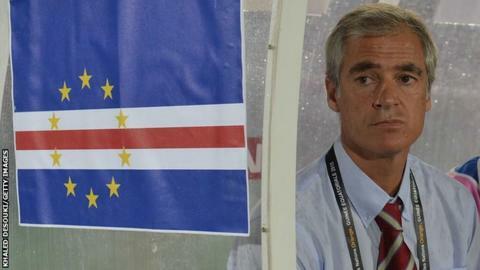 The continued rise of Cape Verde up world football's rankings is under threat after revelations that their coach Rui Aguas has not been paid for the last seven months. Aguas made a cryptic reference to the situation in a television interview after Cape Verde had overcome Kenya to advance on the road to Russia earlier this month. Responding to a question about his relationship with the country's football federation, Aguas told Cape Verdian television: "Things have not gone as well as they should." Since then, it has been revealed the source of his discontent is the payment of his salary, now seven months overdue. The Portuguese news agency LUSA reported on Saturday that the issue has prompted government action, with LUSA saying the government would step in and "find a solution" to resolve the impasse. But it might prove somewhat complicated because the Cape Verdian Football Federation claim Rui Aguas' salary is supposed to be paid by the Portuguese Football Federation as part of a development and co-operation agreement between the two countries. Cape Verdian football chief Victor Osorio has told local radio there is no written contract with Rui Aguas, or his assistant Bruno Romao, who also has not been paid for the last seven months. Osorio said his predecessor Mario Semedo had agreed to take Rui Aguas on at the insistence of the Portuguese. Rui Aguas had not had a head coaching job for 10 years before taking on the Cape Verde role, but had been an assistant with the Portugal national side. The Cape Verde, with a population of just over 500 000, is a former Portuguese colony and has achieved unprecedented success for a country of its size by tapping into the vast immigrant community it has in Portugal and elsewhere in Europe like France and the Netherlands. By using players born or raised overseas, and playing with first and second division clubs across Europe, Cape Verde has risen from a low of 156 in the Fifa rankings in 2000 to 32nd in the world this month, which is their highest position ever. It puts the small country fourth in Africa, behind the Ivory Coast, Algeria and Ghana. The relationship between Rui Aguas and his players has been credited as one of the pillars of their success. The former international striker took over from the eccentric Lucio Antunes, who had provided the early impetus and guided the country to their first-ever Nations Cup in 2013 and a shock quarter-final place in the tournament in South Africa. Rui Aguas qualified the Cape Verde for the 2015 finals in Equatorial Guinea, where the Cape Verdians were eliminated after the first round despite not losing. They drew all three of their matches in Ebebiyin and lost out to the Democratic Republic of Congo only on the number of goals scored.